Mark William Stroud, known as William, was born in West Coker and baptised at Odcombe on 25 February 1894. He was the son of farm carter Eli Stroud (1865-1936) and Jane née Guppy (1864-1933). Eli and Jane had a total of eleven children, four of whom died in infancy. Known children were Edward Robert (1891-1893), Sarah Amelia (1892-1978), Mark William, Priscilla (1895-1950), Eli (1897-1961), Thomas (1900-1970) and Louisa (1902-1952). In the 1901 census Eli and Jane were listed at East Street, West Coker, with their children and in the 1911 census the family were listed at Manor Street, West Coker. Eli gave his occupation as 'Carter on a Farm' and 17-year old William gave his as 'Labourer on a Farm'. In the spring of 1915 William married Louisa Kate Cook (1890-1947) at Yeovil, where they set up home. William and Louisa were to have a daughter, Gladys, in the autumn of 1915 but sadly she died the following spring. William and Louisa lived in Park Street, and from his brief obituary it is known that William worked for Mr Snook of Hendford Hill. William enlisted at Yeovil, joining the 14th (Service) Battalion (West of England), Gloucestershire Regiment. His Service Number 27841 indicating that he enlisted towards the end of 1916. This battalion had been formed at Bristol on 22 April 1915, by the Citizens Recruiting Committee, as a Bantam Battalion (troops under the normal regulation minimum height of 5 feet 3 inches). In June 1915 it came under the command of 105th Brigade in 35th Division at Masham. The battalion was adopted by the War Office 23 June 1915 and moved to Salisbury Plain during August 1915. It landed in Le Havre on 30 January 1916. During 1916 the division received new drafts of men to replace losses suffered on the Somme, but the Commanding Officer soon discovered that these new recruits were not of the same physical standard as the original Bantams, being men of small stature from the towns, rather than the miners and farm workers who had joined up in 1915. A medical inspection was carried out and 1439 men were transferred to the Labour Corps. Their places being taken by men transferred from the disbanded yeomanry regiments, who underwent a quick training course in infantry methods at a Divisional depot set up specifically for that purpose. In 1917 the 14th Battalion saw action during the Pursuit to the Hindenburg Line and at Houthulst Forest, known as the 'Action of 22 October 1917'. This was an attack during the Third Battle of Ypres by the British Fifth Army against the German 4th Army. British attacks had been repulsed at Passchendaele by the 4th Army at the Battle of Poelcappelle (9 October) and the First Battle of Passchendaele (12 October). While the British waited for another dry spell and the completion of plank roads up to the new front line, the Canadian Corps and fresh British divisions were transferred to Flanders by the British Expeditionary Force. On 22 October, the 18th (Eastern) Division attacked the east end of Polecappelle, the 34th Division attacked further north between the Watervlietbeek and Broenbeek streams and the 35th Division (including William Stroud and the 14th Gloucesters) attacked northwards into Houthulst Forest, supported by a regiment of the French 1st Division on the left flank. Poelcappelle was captured but the attack at the junction between the 34th and 35th divisions was repulsed. German counter-attacks pushed back the 35th Division in the centre. William was killed in action during the 'Action of 22 October 1917' at Houthulst Forest. He was aged 25. In its edition of 2 November 1917 the Western Gazette reported "Mrs Stroud, Park Street, received news on Wednesday morning, that her husband, Private Wm. Stroud, Gloucester Regiment, has been killed in action. Priv. Stroud, who was 25 years of age, was before joining the Army, employed by Mr Snook, of Hendford Hill." 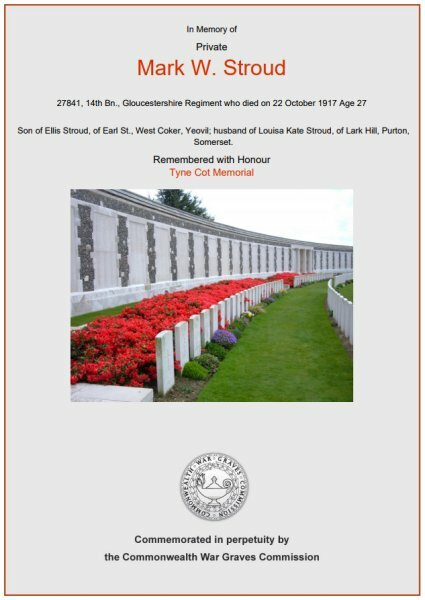 William is commemorated on the Tyne Cot Memorial, Panels 72 to 75 and his name is recorded on the War Memorial in the Borough. The Commonwealth War Graves Commission certificate in memory of Mark William Stroud.